Children’s alphabet friezes typically associate each letter with a picture, ‘a’ with an apple, ‘b’ with a bus’ etc., generally going a bit pear-shaped when they get to X (xylophone? X-ray? fox?). 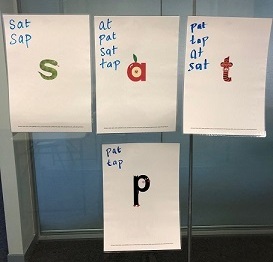 Research shows that integrating letter shapes into relevant pictures is more effective than just associating letters with a relevant picture. You can watch US expert Dr David Kilpatrick (this year’s LDA Tour speaker, details will be here) talk about this at 18:40 on the video clock here, read about it on p272 of his book, or read relevant research here, here, here and here. 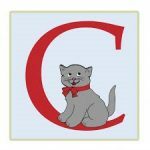 The embedded picture mnemonic on the right below is thus more likely to help learners remember the letter C than the image on the left. 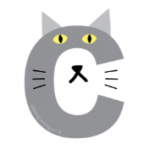 Available sets of embedded picture mnemonics are often designed from a print-to-sound orientation, and thus only represent 23 sounds, because the letters c, k and q represent the same sound, and x represents /k/ plus /s/. Sometimes these sets include digraphs, but often don’t depict words containing relevant sounds e.g. the digraph ‘sh’ as ‘s for snake’ plus ‘h for horse’, though neither the word ‘snake’ nor ‘horse’ contains the sound /sh/. To work in a logical, sound-to-print way, it helps to have a visual for each sound. 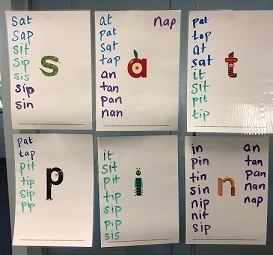 This clearly shows children that we have many more sounds than letters, and often combine letters to represent one sound. Once all the sounds are known, additional spellings for each one can be taught, as well as the ways sounds share spellings (e.g. out/soup/cousin/cough). Sound walls make more sense to young children than word walls. US expert Dr Mary Dahlgren explains why here. 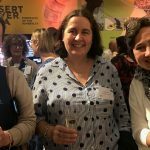 She suggests including photos of children’s mouths saying the relevant sounds on sound walls, and has suitable photos and other word wall resources available here. 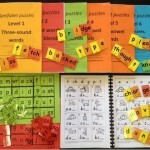 Big charts showing all the sounds and their main spellings can overwhelm beginners and strugglers. Embedded picture mnemonics can be used to develop your own charts with children’s involvement, in manageable steps. Example words can be refreshed, to keep them interesting and relevant. 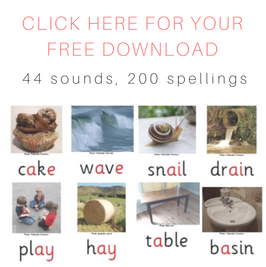 Find free wordlists to choose words from here. 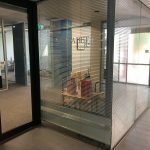 Laminate and store/display the mnemonics on a wall, noticeboard, window or room divider. If working with absolute beginners, just start with a few, and add more over time as you teach them. If you don’t have enough space for the A4 version, print them two to a page (A5). Knowing that these are pairs helps children understand why they sometimes use each other’s spellings, e.g. the /v/ in ‘of’ and ‘Stephen’, the /z/ in ‘is’, ‘as’, ‘please’ and ‘scissors’. Organise consonants according to where they’re made in the mouth, e.g. • Back-of-the-mouth sounds at the bottom. 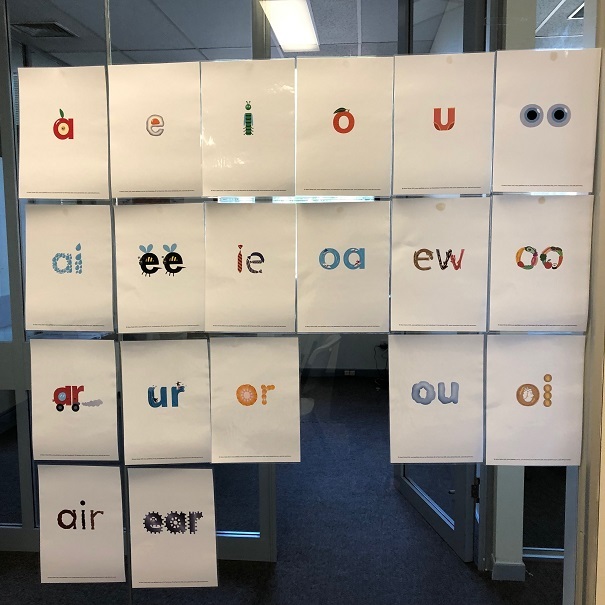 In displaying the vowels, I suggest putting the ‘short’ vowel sounds (which must be followed by a consonant) on the top row, ‘long’ vowels next, and the ‘r-controlled’ vowels and other two stressed vowels at the bottom. When you start teaching about extra and shared spellings, you can point out that the usual spellings for the sounds in the top row can also be used for the second row (e.g. ant/apron, hit/hi, not/no, flush/flu). 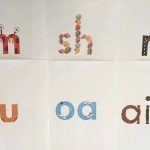 As new sounds are added so that new words are able to be spelt, the words children have consolidated and can spell independently can be erased, to make space for the new words. 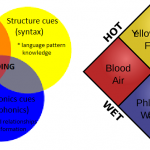 Once students have learnt a spelling for each sound, they can start learning its other spellings systematically. 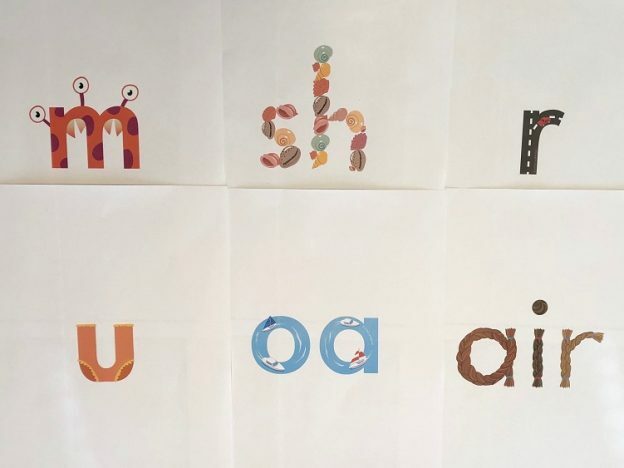 For example, if studying the sound /f/, children might brainstorm the words ‘fun’, ‘film’, ‘defend’, ‘off’, ‘fluffy’, ‘cliff’, ‘Sophie’, ‘elephant’, ‘cough’ and ‘laugh’, and these can be grouped under the headings ‘f’, ‘ff’, ‘ph’ and ‘gh’. Once there are too many words to write them all in whiteboard marker, lists in smaller print can be attached. Displaying lists of words, rather than a single example word, makes it clear that many spellings have typical locations and neighbours (e.g. ‘ay’ at word endings, ‘igh’ usually before ‘t’). 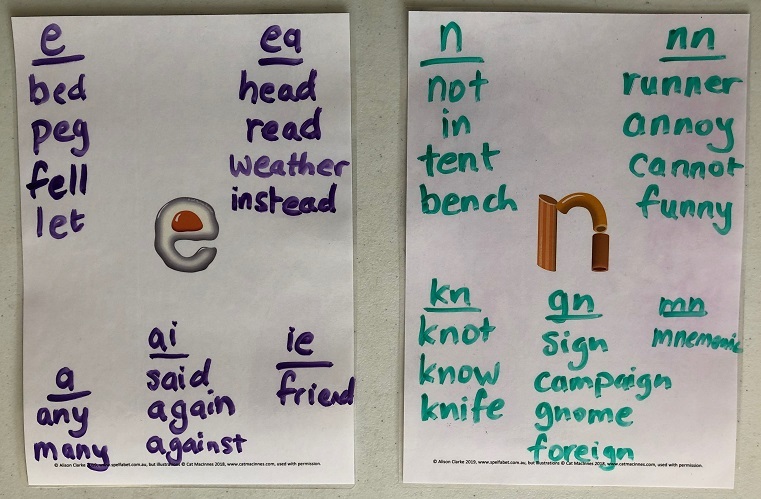 I hope you like these embedded picture mnemonics, and find them helpful in teaching children about English speech sounds and the complicated way we represent them with letters. * Except the unstressed vowel, which is stressed when working through words slowly, syllable by syllable, so that it is pronounced a variety of ways based on how it is spelt. Hi There, thanks for this resource. 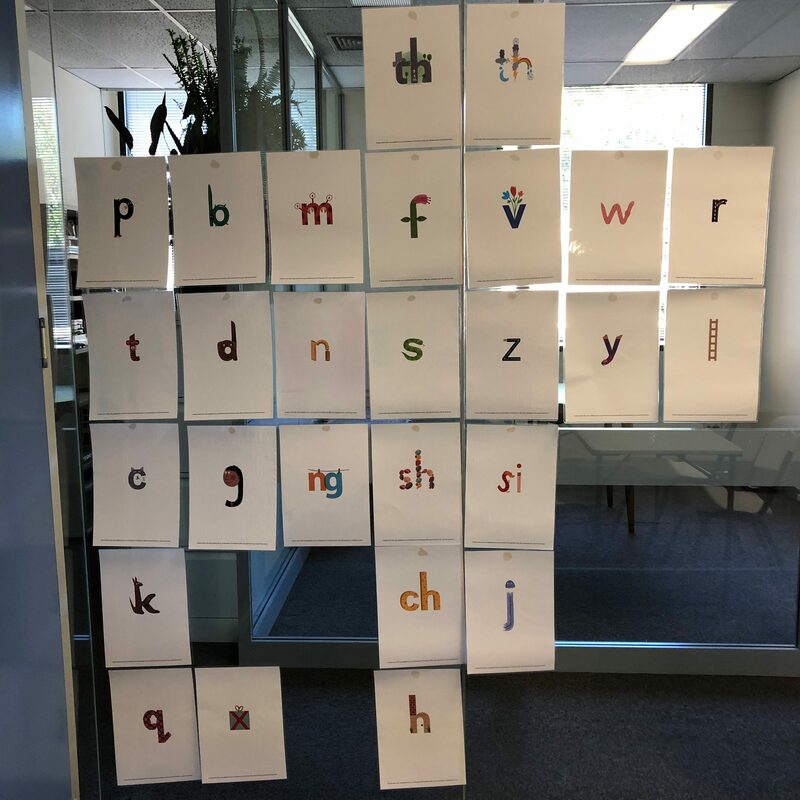 As a preschool/ kinder teacher in Victoria, I have used abc charts at the post office table, for children who want to write real words, or initials. We use abc jigsaws and alphabet books, we play with magnetic letters etc and I usually introduce them to letters through the year starting with the letters beginning their Names. Is it appropriate to display your whole chart just as I would have done with the abc chart. I thought I might add it for the ones who do notice that the written letters are not quite as straightforward as the chart suggests? Alison, this is not a comment but a query. I would like to purchase the posters but I have to put an order in first to my admin – so would you be able to send me an invoice with your ABN and name, address, fax number if you have one, etc? Sorry about this, I know it’s unnecessary admin from your end. Yes, I can send you an invoice with an ABN and things that bursars like. What is the organisation’s name? Do you have these available as part of the download on an A4 sheet – back to back – in the layout you have demonstrated? Just thinking this would be a good visual for children to have on their desks as well when writing. Very keen to use. Thank you so much! I have been looking for something like this for a long time (that weren’t Read, Write Inc). If i purchase, can I download rather than send the hard copies? Yes, all the things in my website shop are pdfs that you download and print yourself. I would never be able to print, store and post them so cheaply. I’m assuming that teachers have access to colour printing. Thanks figured that out once I purchased them haha! Great resource, thanks again. These are fabulous and I love her illustrations. Can I ask one thing though…we are starved for brilliant resources like these using the fonts we teach in each state. 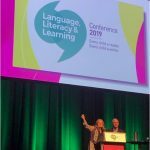 As I would like to use these as a lesson resource as well as room decoration, it would’ve SO exciting to have the letters in Foundation font (NSW teacher)! Please consider this if ever doing a revision. I ordered these and did not receive a link to download. Wondering if my order and payment went through?